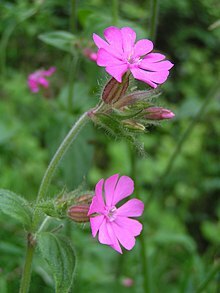 Silene est genus plantarum florentium familiae Caryophyllacearum, quod, maximum familiae genus, circa 700 species continet. Multae species latam distributionem geographicam habent, praecipue in hemisphaerio septentrionali. Vocabulum Silene est forma feminina Sileni, deitatis silvestris in mythologia Graeca. ↑ 36. Silene Linnaeus. Flora of North America. ↑ Silene undulata Aiton. SANBI Red List of South African Plants. ↑ 5.0 5.1 Country Study for Biodiversity of the Republic of Macedonia (First National Report). Skopje: Ministry of Environment and Physical Planning. 2003. ISBN 9989-110-15-8 . ↑ United States Department of Agriculture (2011). "Silene ovata Pursh". USDA Plants Website . ↑ Royal Botanic Garden Edinburgh (2001). "Silene paeoniensis". Flora Europaea Website . Pink, A. 2004. Gardening for the Million. Project Gutenberg. Project Gutenberg Literary Archive Foundation. Quattrocchi, U. 1999. CRC World Dictionary of Plant Names 4:2482. ISBN 0849326788. Vicimedia Communia plura habent quae ad Silene spectant. Novissima mutatio die 20 Septembris 2017 hora 12:36 facta.